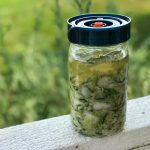 Looking for an easy Dill Sauerkraut Recipe? You’ve found it! This easy recipe is sure to be a hit with all sauerkraut lovers! Happy fall everyone! I can’t believe summer has come and gone. We really had a great summer here in central Wisconsin. It was definitely one of the hotter ones we can remember with lots of sunny and beautiful weekends. No complaints from us though because we know this season is always short lived. We got a lot of use out of our kayaks and enjoyed plenty of drinks and meals al fresco. We also joined a CSA for the first time in a lot of years. We’ve been reacquainting ourselves with many different vegetables this year: fennel, turnips, kohlrabi to name a few. This post contains affiliate links, thanks for your support. My favorite part of participating in this CSA is that we are eating totally in-season. Which means everything is FRESH! This also means we’ve been out of sauerkraut for a long time! 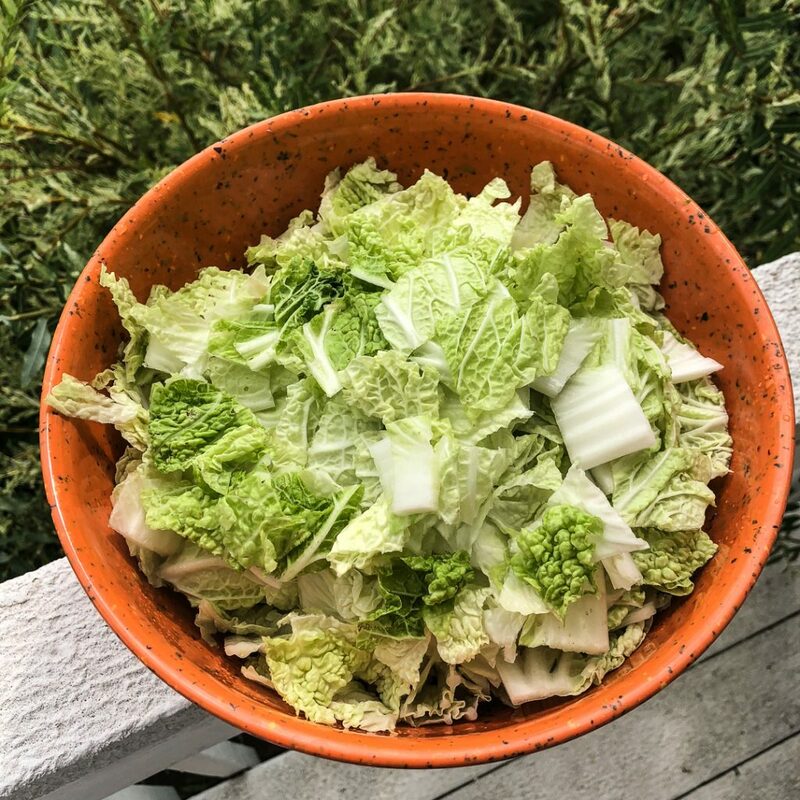 And much to our delight about a month ago, we found napa cabbage in our box! SCORE!! That same week we received a bunch of crazy good smelling dill, so we knew right away that dill sauerkraut was in our future. To be honest, I can’t believe we haven’t made this before. 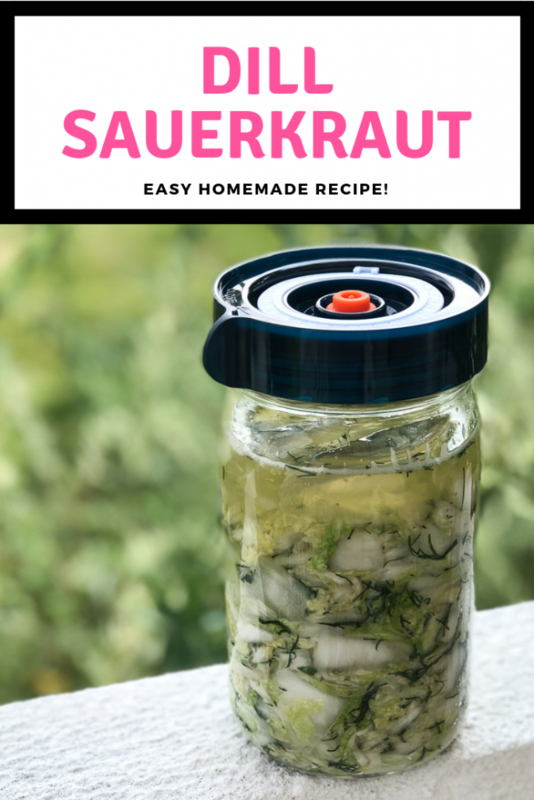 It is by far one of the easiest sauerkraut recipes to make and the result is so delicious. First, prep the napa cabbage by rinsing away any visible dirt, removing the outer leaves and trimming off the stem. Set leaves and stem aside for later. Next, shred the napa cabbage. You can do this with a cabbage shredder, food processor or simply use a knife and cut very thinly. Next, place half of the cabbage in a large bowl or pot and add half of the salt. Massage the cabbage until it begins to sweat. Add the remaining cabbage and salt and then repeat the massaging process. If you’ve never massaged cabbage, basically think of it as grabbing by the handful and squeezing (like a sponge) and repeating over and over. This will squeeze the water out of the cabbage. You’ll know your cabbage is ready when it’s dripping wet and there is a small amount of liquid in the bottom of your bowl. We use this salt to cabbage ratio: 1 tablespoon salt to 1 3/4 pounds cabbage. Any kind of salt is fine as long as it does not contain iodine. Iodine is an antibacterial agent and can interfere with the fermentation process. We use Himalayan or sea salt in our house. Next, chop up your dill. We used a small bunch for this recipe but you could definitely use more or less depending on your preference. Add dill to your cabbage and mix with hand to combine. Now it’s time to pack your jar. Grab your glass jar and drop some handfuls of your cabbage and dill mixture. Pack down with a wood spoon or cabbage pounder. Add some more of the cabbage and dill mixture. Repeat the process over and over again until your jar is nearly full. Always be mindful that you are really packing down your mixture each time. You’d be surprised just how much you can fit in one jar. Fill almost to the top but leave a little room for your “weight.” It’s important to keep everything you want fermented submerged in brine because the microbes convert sugars into lactic acid which inhibits the growth of harmful bacteria. 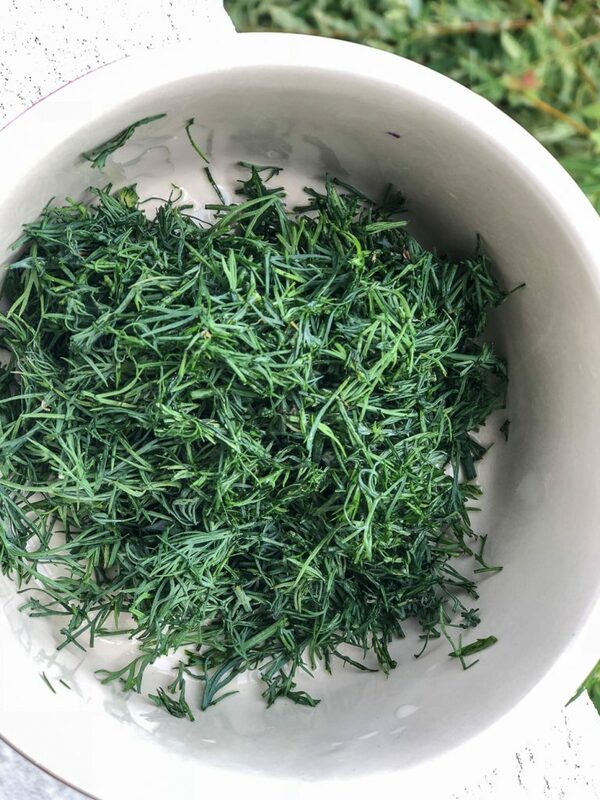 It’s easy to do this with cabbage stems and leaves you set aside beforehand, simply place some of the outer leaves on top and top those with the core (these are your “weights”). You can also use glass fermenting weights. We like these because they are heavy and we always know everything will be weighed down and kept under the brine. When it comes to putting a lid on your sauerkraut, you can simply use the lid that came with the jar. If you decide to go this route, you’ll need to put your jar on plate and burp it every day for the first 3-5 days. If not, you’ll risk the liquid overflowing out of the jar and making a smelly mess. Burping your jar allows the CO2 gas to escape. The plate is to protect your countertop in case you forget to burp. To burp, open the jar slowly and close. The other option is to use an airlock type lid. An airlock allows for gas to escape without letting any oxygen in. This lets you ferment in a completely anaerobic environment. For this recipe we used an Easy Fermenter lid. This lid works as an airlock so we can simply “set it and forget it.” I’d recommend them if you’re sick of burping and smelling your sauerkraut. The Easy Fermenter comes with a built in date reminder. Simply set the date you begin the ferment and you’ll always know how long your cabbage has been fermenting for. We let this batch of dill sauerkraut ferment at room temperature for three weeks before moving to the refrigerator. The result is a nice crunchy sauerkraut with a yummy dill kick! Easy dill sauerkraut recipe is a great addition to any meal! Prep the napa cabbage by rinsing away any visible dirt, removing the outer leaves and trimming off the stem. Set leaves and stem aside for later. Place half of the cabbage in a large bowl or pot and add half of the salt. Massage the cabbage until it begins to sweat. Add the remaining cabbage and salt and then repeat the massaging process. Add the dill to your cabbage and mix to combine. 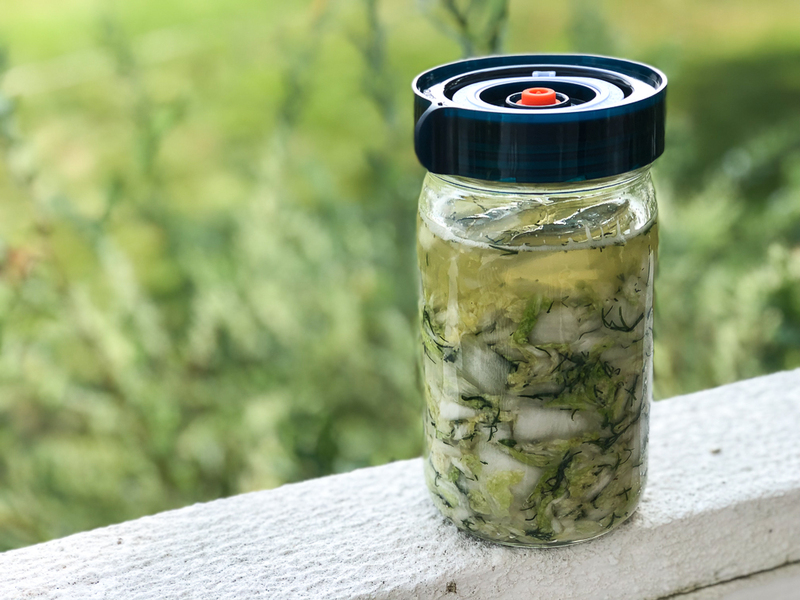 Pack your jar with the cabbage and dill mixture. Leave about 1-2" of head space. Place fermenting weight or outer leaves and stem on top to be sure everything is submerged in brine. Cap or place an airlock device on jar and leave sit at room temperature for 3-4 weeks.